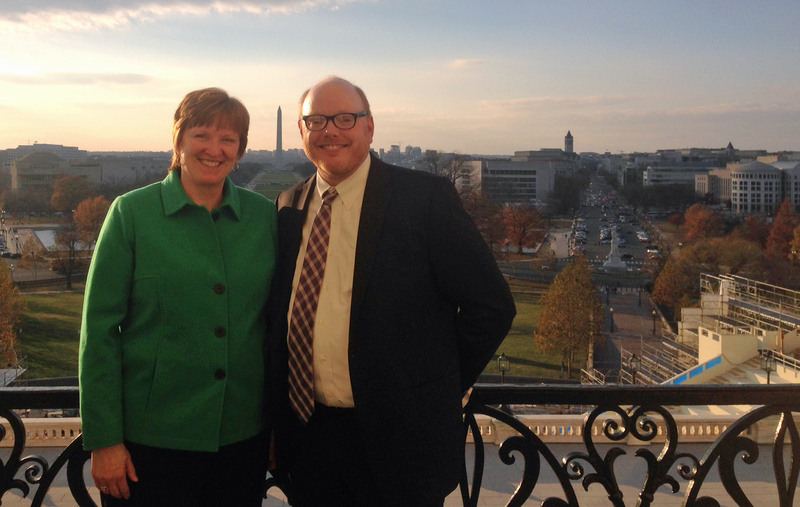 In December 2016, Harry Denny, Associate Professor of English and Director of the Writing Lab, and Kris Ratcliffe, Professor and Head of English, visited Washington, D.C., to introduce Purdue’s Writing Lab and Online Writing Lab (OWL) in a visit coordinated by Purdue lobbyist Jordan Wicker. They spoke to Congressional staffers from across the country about writing techniques and answered questions about tips to improve writing. In addition, Dr. Denny spoke about the Writing Lab’s history, recognized its 40thAnniversary, and addressed the impact of peer tutoring on student success. Drs. Denny and Ratcliffe also provided an overview of OWL, the widely-recognized internet resource for writing, and noted the sheer volume of its traffic and global reach to six continents and in excess of 300M pages views annually. Moving forward, Purdue hopes to hold a writing workshop on the Hill to continue to help staffers and legislative employees with their writing and to showcase Purdue and continue to gain exposure for the Writing Lab and OWL, teaching and research centers that benefit Purdue students, faculty and staff.